Milton Keynes' planners tried to 'do themselves out of a job' by combining socialist planning with flexibility and democracy. 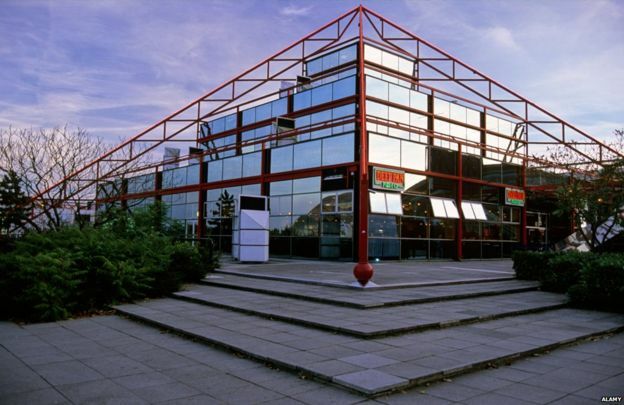 The Point in central Milton Keynes was one of the UK's first multiplexes when it was built in 1985. The MK Gallery in Milton Keynes is re-opening this month, with an exhibition The Lie of the Land, on its original ideas. This presents a welcome reappraisal and celebration of Milton Keynes’ radical social vision, as part of a wider survey of the politics of Britain’s changing landscape. This exhibition presents a way of rethinking the received wisdom about the spaces and forms of British culture, by juxtaposing different stories of ideal and actual landscapes across time and space. Milton Keynes is not only the venue, but is also the subject of this reappraisal; it is the logical place to try to reclaim the idea of urban experimentation for the many from the dustbin of history. Unlike the NHS, which even while being eroded and undermined by Conservative governments, is broadly considered a national treasure, the state provision of public housing and future-focused urban infrastructure has not been remembered as fondly, despite being as central a part of the welfare state as the provision of healthcare. This is partly because early phases of postwar urban planning, from inner-urban regeneration to new town construction, were explicitly paternalistic. They were developed with such inflexibility that, as Peter Hall put it in Cities of Tomorrow, “no repeated learning process was involved, since the planner would get it right first time.” This meant that when gaps in infrastructure provision developed, or when resident populations grew and changed over time, that there was more limited capacity for the form of the town to evolve with its residents. To characterise all instances of British state-sponsored planning in this way would accede to the simplistic historical caricature of the “postwar consensus” as some kind of singular, monolithic entity which failed organically, only to be “rolled back” by the Thatcher government. It would also do a great disservice to the many planners, academics, civil servants and ministers who were genuinely committed to improving Britain’s social and physical fabric and who in doing so, continuously challenged and sought to improve the ways in which state planning could meet the needs of British people in the present and in the future. Milton Keynes was the moment where, under the Harold Wilson governments of 1964-1970, there were real attempts to learn from the limitations and mistakes of earlier policy. This approach to providing the best, without “insulting” those to whom it was provided, was also central to the planning of Milton Keynes, where planners sought to “do themselves out of a job” by allowing residents to shape their own community. This was to be achieved through flexible planning, which would provide residents with as much choice as possible in housing, schooling, employment, shopping and leisure. It was also to be through ensuring that the forms of the town itself were as flexible as possible. The proposed low rise and low density districts incorporated extensive green space into the plan, while facilitating future land-reuse and infill to meet changing community needs. These goals were also to be pursued through extensive support for self-determining grassroots programmes such as local radio and cable television networks, support for music and sports, and an artist-in-residence programme, where sculptor Liz Leyh helped local children and families create public art, shaping the landscape of the town with their own hands. This democratic, inclusive approach to participatory community art is part of the great injustice of how Leyh’s own parting gift to Milton Keynes, a set of concrete sculptures of cows, would come to be so virulently criticised in national media as symbols of artifice and sterility. Milton Keynes’ media reputation as a cultural wasteland has never been accurate, and it is a myth mainly perpetuated to deride and preclude the political challenges which the town’s founding ideas continue to pose. The idea that a large-scale, state-sponsored urban planning project of this nature could be so experimental, and to place so much faith in the success of its experiment in its residents, remains one of Milton Keynes’ most radical and distinctive features. It continues to testify to the powerful idea that tradition and continuity are not the sole determinants of value, and that new forms of value can be created. It refused to pre-empt the desires of its residents; instead it met them with respect, where “opportunity and freedom of choice” were conceived as going beyond consumer choice in the marketplace, but on a more fundamental and profound level. The value in reconsidering Milton Keynes, and postwar Labour policies more broadly, is not to seek to reclaim the past or return to it – but rather, to reclaim their radical faith in the potential to build better futures. Lauren Pikó is an early career fellow at the University of Melbourne. Her book Milton Keynes in British Culture is published by Routledge.